Hamilton’s concluding song asks: “Who lives?/ Who dies? / Who tells your story?” This is an apt statement for a musical that explores the foundation of the modern United States on its own terms, just as it sets about making history of its own. It arrives in Britain in a blaze of publicity and tickets have sold like hot cakes. At home it is changing the landscape of Broadway and even musical theatre at large. It has become rooted in the US public consciousness, with Rolling Stone describing it as a “miracle of modern history”. There was buzz from the start about the story of “the $10 founding father without a father”. And since premiering Off-Broadway at the Public Theater in February 2015 and then transferring uptown to Broadway’s Richard Rodgers Theater that summer, Lin-Manuel Miranda’s musical phenomenon has regularly broken all box office records. In the Thanksgiving week that ended on November 26, it smashed its own record, taking more than $3.4 million across eight performances – nearly 10% of Broadway’s total gross on what is traditionally a record-breaking week on the Great White Way. The century so far has also of course brought us The Producers, Wicked and The Book of Mormon. The current season will see the arrival of big brand blockbusters including a stage version of Disney’s Frozen and Harry Potter and the Cursed Child (transferring from London), opening a month apart next spring. But Hamilton looms over all of them. It has ushered in – and speaks to – a larger cultural conversation, far beyond a theatrical one. It is one of historical narratives: how they are formed and who owns them – who tells the story? It has been called the “Obama-era musical”, but it continues to resonate ever louder in the age of the 45th president of the United States. The show pre-empted Donald Trump by some years of course – but it also had an uncomfortable prescience about events that followed the election. Miranda, the sole author of the show’s book, music and lyrics – as well as taking the title role in the original production – has been a vocal critic of the administration and has used messages in Hamilton to criticise public policy. One was from the Hamilton Mixtape, a compilation of songs inspired by, and remixed from, Hamilton, which topped the Billboard 200 when it was released last December. One of the polemical songs was Immigrants (We Get the Job Done), featuring rappers K’naan, Residente, Riz MC and Snow Tha Product, and promoted fundraising for a group of immigrant-rights not-for-profit organisations based in the US. Hamilton has, in other words, become a lightning rod, as great art always does, for other people to find their voices. And a story about the foundations of America also feeds into the battle for its future. The musical made political waves even before Trump took up office. His running mate, and now vice president, Mike Pence went to see the show with his family in November 2016. It made headlines when the cast addressed him at the curtain call. 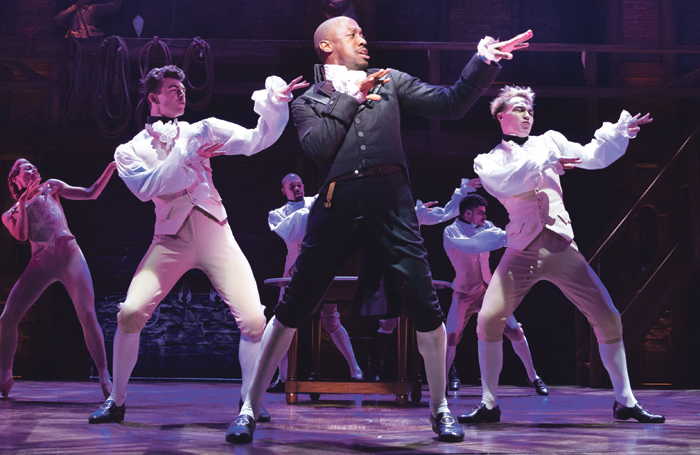 Brandon Victor Dixon – who was playing vice-president Aaron Burr in the show – stepped forward. He had to silence audience members who were booing Pence, saying: “There is nothing to boo here, ladies and gentlemen, we are sharing a story of love”, before reading a prepared statement. In response, Trump rage-tweeted the next day: “Our wonderful future VP Mike Pence was harassed last night at the theater by the cast of Hamilton, cameras blazing. This should not happen!” He also called for an apology. To add to its political heritage, one of the earliest public outings for Hamilton, or at least material from it, was at the White House. In 2009, Miranda performed the opening number from the show in front of President Barack Obama and First Lady Michelle Obama. The seeds of the musical were planted when the author took Ron Chernow’s biography of Alexander Hamilton on holiday with him to Mexico. Reading his story prompted Miranda to equate Hamilton to a hip-hop star. When the White House invited him to perform a piece about the “American experience” he decided against material from his first musical In the Heights and went with Hamilton, though he had only written one song of what was supposed to be an album at that stage. And that’s exactly what Miranda’s show has done. In 2016, Miranda returned to the White House for a schools event hosted by Michelle Obama, with other members of the cast. Obama spoke of seeing the finished show at the Public six years after that initial White House presentation. “It was simply, as I tell everybody, the best piece of art in any form that I have ever seen in my life,” she said. Speaking to high-school students from three local schools at the 2016 White House event, one told Miranda it had helped him to learn things that he “wouldn’t normally learn” in class, because he struggles with history. Was this musical made for kids such as him, he wondered? Miranda responded: “Honestly, I was just like you. I was not a history major.” Instead, he learned about the world through theatre. As a result, he knows “a weird amount about Eva Peron” and “a certain phantom of a certain opera house”, referring to Andrew Lloyd Webber’s Evita and The Phantom of the Opera. Eustis was instrumental to that gestation. “By working on it here [at the Public Theater], we were trying to make it the best possible version of itself. 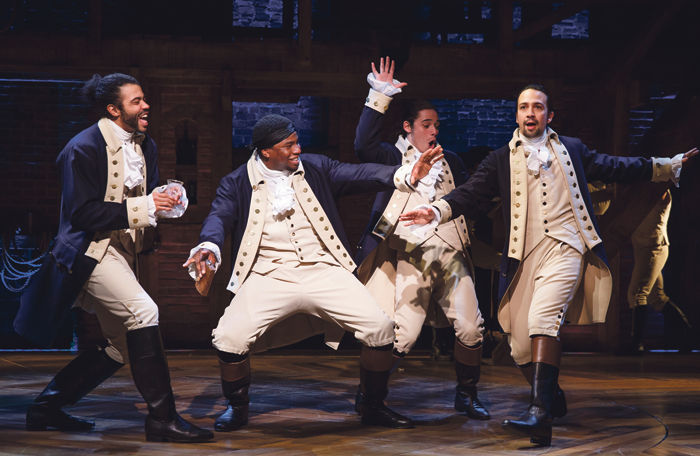 And the real brilliance of Hamilton is that it reflects who Lin-Manuel Miranda is,” he says. Stephen Sondheim was also an early admirer and mentor of Miranda in the writing of the show. 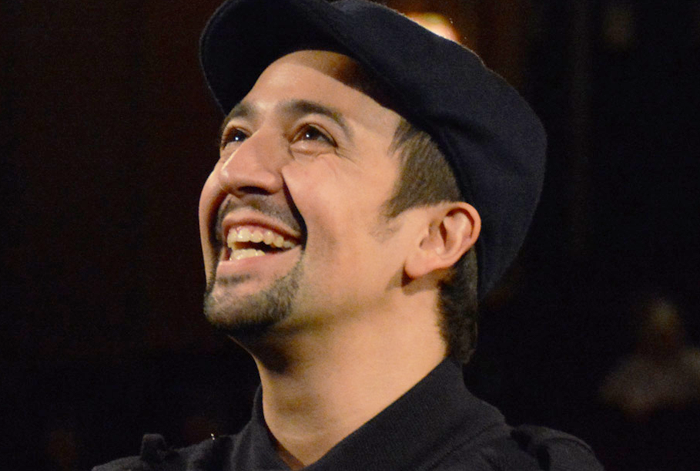 He told the New York Times: “When I first heard Lin-Manuel’s songs, I immediately thought of Rock Island, the opening number of The Music Man. It’s one of the most brilliant numbers ever written and the first time anybody had attempted to make music out of speech in the American theatre. It doesn’t have the attitude of rap and nobody thinks of it as rap, but the technique is rap. Sondheim complained in another interview that most theatre is “too insular to age well”, but Hamilton might change that. Perhaps, he said, it could open the door to producers to take more chances on new work. So the show was forged in a love of theatre and its possibilities. And that’s also where its emphasis on the diversity of the cast came from. Speaking at the White House schools event in 2016, director Thomas Kail said: “That was a really early and essential conversation we had.” He added that it was important that they take a world that “feels like a sepia tone” and make it look similar to the modern world. 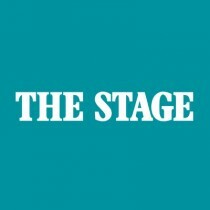 Could it be a marker for the future of musical theatre? Sondheim is cautious, telling the New York Times: “Hamilton is a breakthrough, but it doesn’t exactly introduce a new era. Nothing introduces an era. What it does is empower people to think differently. 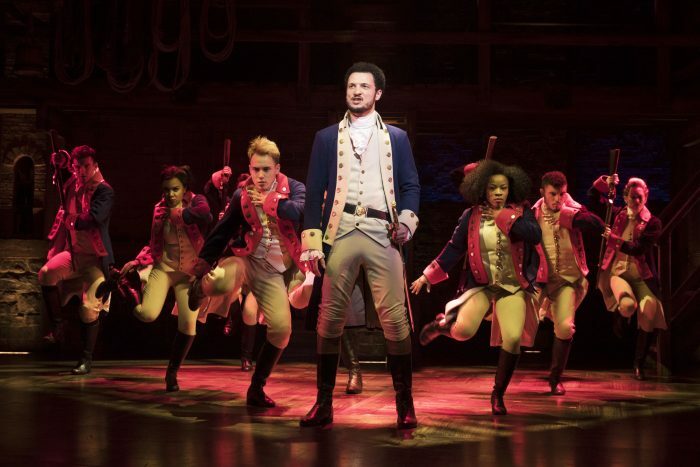 And now, while it is still running on Broadway and has two other North American productions, Hamilton is making its first foray beyond the US to an international market in London. Tickets are already in extremely short supply and selling at some of the most premium prices in the West End, which attests to the flood of publicity that has preceded it – and all the talk in the US that this is an era-defining piece of work. It is going to be influential in many ways. Not least, as its London co-producer and landlord Cameron Mackintosh has said, for showing off its British stars and the diversity and quality of this country’s talent pool. Was Hamilton a critical success from the very beginning or did it take a while to get noticed? 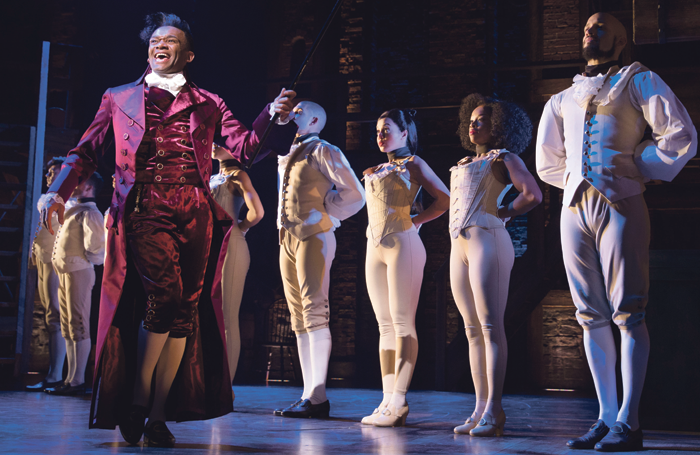 Since it premiered Off-Broadway almost three years ago, Lin-Manuel Miranda’s record-breaking, chart-topping, trend-setting hip hop musical about Alexander Hamilton has rarely been out of the headlines. Whether it’s New York ticket prices sailing past $2,000, vice-president Mike Pence getting a plea from the stage and boos from the auditorium on his trip to see it, or Miranda freestyling with Barack Obama in the Rose Garden, it keeps bobbing up to the surface of the US’s national consciousness. How did US theatre critics respond to Miranda’s mega-hit musical on its journey from Public Theater phenomenon, to Broadway big-hitter, to international success? Were they always fully supportive, spotting this cultural phenomenon from the first preview or does their early copy suggest it initially passed them all by? With its roots in Ron Chernow’s 2004 biography of Alexander Hamilton, it officially opened at New York’s Public Theater on February 17, 2015. And it turns out the critics were on-board from the very start. It was an instant hit, a revolution in form and content. It was “a breath-taking pageant” according to Peter Marks of the Washington Post, “an extraordinary achievement”, USA Today’s Elysa Gardner said, and “a wonderfully humanising view of history” according to Marilyn Stasio in Variety. Broadway beckoned on August 6 of that same year. 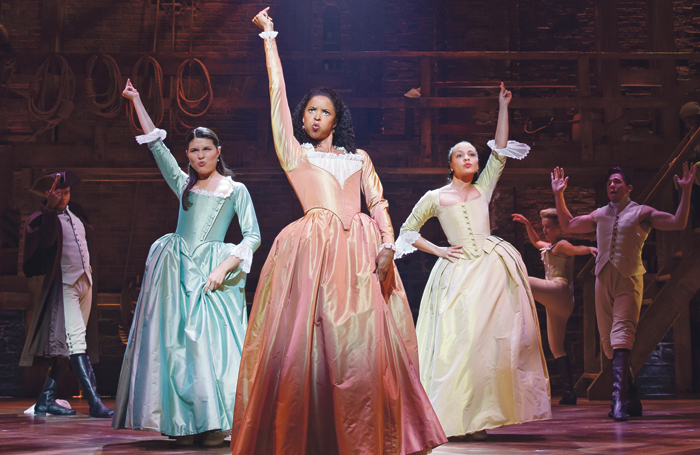 Hamilton opened uptown at the Richard Rodgers Theatre, where it has remained ever since. The critics, returning for a second time, were bowled over once again. “If this sort of thing catches on, the old, reliable Broadway show tune may be a thing of the past,” observed Stasio. And six months after its Off-Broadway premiere, as the election machines kicked into gear, US critics were more perceptive of Hamilton’s political implications. At a moment when the country wrestled with its national identity, here was a musical that boldly retold its founding mythology, and did so in thrilling style. Despite the niggles, it’s still been success after success for Miranda’s musical. It triumphed at the 2016 Tonys, earning a record-breaking 16 nominations and winning 11, and was also awarded the 2016 Pulitzer Prize for Drama. A Chicago version opened in September last year, and a US tour set off in March. And now it arrives in the West End, with a new lead, a new audience, and a new set of critics to impress. Will London’s reviews be as effusive as their transatlantic counterparts, or will they be singing a different tune?